Sandbox Couture is a popular online children’s boutique which has always served up stylish threads for babies and toddlers. They recently went ‘green,’ and are now offering eco-friendly clothing for kids. Small Plum is one of the new organic clothing collections featured at Sandbox Couture, and the lovely, earthy designs and colors of Small Plum one pieces make them perfect attire for organic summer babies. 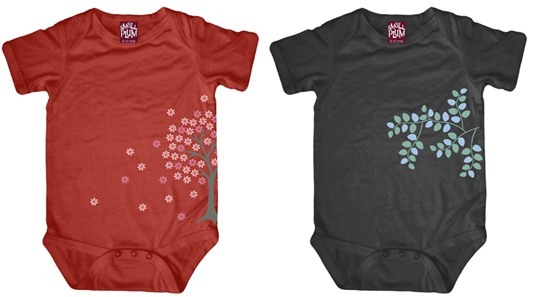 Small Plum creates organic bamboo baby garments that are processed naturally. They offer PVC-free screen print designs that are water-based and eco-friendly. Other benefits of the Small Plum line include qualities such as: naturally odor resistant, UV ray protection, hypoallergenic, and anti-microbial. The Small Plum one pieces for babies are offered in sizes 0-3M, 3-6M, 6-12M and in an array of great designs and colors. Sandbox Couture is a popular online children�s boutique which has always served up stylish threads for babies and toddlers. They recently went 'green,' and are now offering eco-friendly clothing for kids. Small Plum is one of the new organic clothing collections featured at Sandbox Couture, and the lovely, earthy designs and colors of Small Plum one pieces make them perfect attire for organic summer babies.